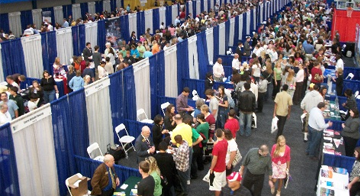 Every year, more than 650,000 people attend a NACAC college fair somewhere in the U.S. Yep...you read that right...every year, a HUGE number of people go to at least one of these events. But why are they so popular? And are they really worth going to? This week, we've got a playlist of three videos that will tell you everything you need to know about the National College Fair. First up is one of the training videos from our college prep app. In this video, Kristina explains what the fair is all about, and gives some great advice on things you should think about when attending. Then we've got two videos that were created by @NACAC — the National Association of College Admissions Counselors — which is the organization behind the National College Fair. The videos show you what a fair actually looks like, and give some more advice on getting the most out of each one. We're big fans of the these events, and recommend that every high school student attends at least one of them in their local area. So go ahead watch these videos...and you'll be totally prepared for the next time the National College Fair comes to town! We'd love to get your thoughts. If you've attended a fair, how was the experience for you? And would you recommend it to other students?